Things seemed to get off to a good start. Nina’s new hometown is the charming village of Coconut Cove, with its narrow lanes lined with candy coloured houses and gardens overflowing with tropical flowers. But local big shot Barry Bassett has his eye on Nina’s cozy little beach cottage with the aim of tearing it down to build condos. Then Barry’s obnoxious wife Tiffany goes missing, and Nina finds herself sitting across a desk from the very serious chief of police, Blue Roker, wondering how her day dream of easy living in the islands got so far off track so quickly. 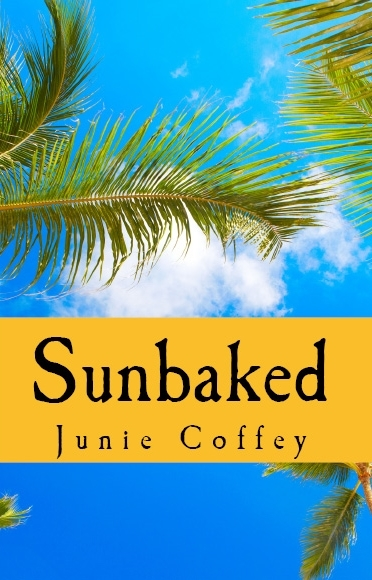 Sunbaked, the Pineapple Cay novel featuring Nina Spark, accidental detective is available at amazon.com or at your local bookstore. Author Junie Coffey lives with Fisherman Fred and Hurricane Annie in a little town north of 45 degrees latitude which got two hundred inches of snow last winter. She has lived, worked and travelled throughout the Caribbean, and spends time in the islands every chance she gets.